This is an amazing laser light effect with red, green and yellow colours, multiple effect patterns as per pictures and a built-in multi colour LED water wave wash light! As with any party, for the best effects you would use a smoke machine to enhance the light effects and bring the colours to life. The NEW LED lighting technology! One of our most popular disco lights! Easy to use – just plug in and party. For the best effect with lights use with a smoke machine. 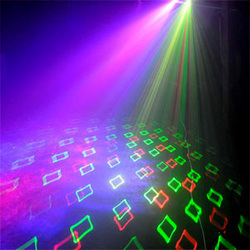 This lighting effect punches out multi-colour red green and blue beams of light in rotating patterns that are guaranteed to dazzle your dance floor. When combined with one of our smoke machines, you get colour mixing in the smoke that looks amazing, with many different blends of colour coming through the smoke.